Half-hardy, perennial, often grown as an annual. Compact bushy habit with lance-shaped, wavy-edged, greyish green leaves. 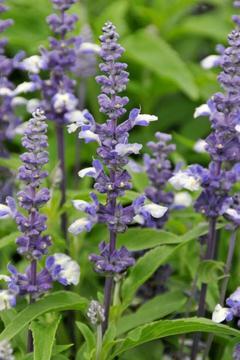 Sturdy stems carry delicate spikes of small bi-coloured blue and white flowers. Most well drained soils in full sun. Needs frost-free winter conditions or treat as an annual. Drought tolerant. From seed, sown in February or March at between 18 to 25°C. Transplant outside after risk of frost has passed. Interesting cut flower. Can also be dried. Bred by Ernst Benary Samenzucht GmbH, Germany.